Sir Thomas Wentworth (who later changed his name to Blackett) was the 5th Baronet of the Wentworth Baronetcy of West Bretton in Yorkshire. He inherited the title and family seat of Bretton Hall from his father Sir William Wentworth. Sir Thomas’s mother was Diana Blackett, youngest sister of Sir William Blackett III. Her marriage to Sir William Wentworth brought considerable wealth to the family which enabled the couple to design and build the present Bretton Hall, demolishing the old hall and chapel in the process. When Sir William Blackett III died in 1727 without a male heir, the Blackett lead fortune and associated estates in Northumberland passed to his nephew Sir Walter Calverley Blackett. Sir Walter also died without male issue and under the terms of Sir William III’s will the inheritance was transferred to Sir Thomas Wentworth in 1777. As a condition of his inheritance Sir Thomas was obliged to change his surname to Blackett. Sir Thomas was a colourful character. His self-professed interests were hunting, horses and horse racing, drinking, women and improving his estate at Bretton Hall (it was Sir Thomas who established the lakes and parkland there). Although he never married, Sir Thomas is believed by some sources to have fathered at least 10 illegitimate children. Little is known about the maternal pedigree of his offspring but it seems that he acknowledged and supported several of them at least. Although Sir Thomas benefited substantially from his inherited Blackett fortune he appears to have taken little interest in the running of the lead company preferring to leave that in the capable hands of his Chief Steward in Northumberland, John Erasmus Blackett. 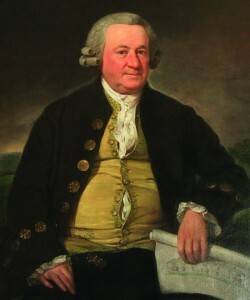 When Sir Thomas died in 1792 the Bretton Hall estate and the Blackett lead fortune was inherited by his eldest illegitimate daughter, Diana, and her husband Thomas Richard Beaumont.